The use of tablets have drastically increased over the past few years as there are now more demands for mobile computing on the go. Different tablet makers try to customize their product so as to retain their leverage in the tablet war. Apple tablets are based on their iOS while Google’s is on their Android OS. That is why I was happy when I heard that Microsoft is releasing their own tablet PC called Surface. For a very long time there has been great difficulty for Apple tablet users to read Microsoft’s documents on their tablet. With Apple’s dominance of the tablet market it is difficult for most iPad users to read Microsoft documents on their tablet as both are products of different companies and are not compatible. I want to show you today how you can read all Microsoft documents on your iPad or any other Apple product like iPhones. Using the method I am going to show you below, you will be able to view Microsoft Word, Excel, PowerPoint etc on your iPad or iPhone. Microsoft Office formats are not compatible with Apple’s iOS so my little tricks here will definitely be useful to any Apple tablet or smartphone user. CloudOn: Cloud computing has made it possible for us to host our applications on cloud servers and access them from anywhere in the world with any device at any time. With CloudOn for iPad you can view your Microsoft documents on iPads or iPhones. With this app, you can view virtually any file type including PDF, JPG,PNG,GIF etc on your Apple tablets. OnLive Desktop: OnLive Desktop is a service that provides a seamless, no-compromise, instant-response cloud-based PC desktop, wherever and whenever you want it. OnLive brings to your iPad a high-performance PC experience, regardless of the content, even when interacting with fast-action media. 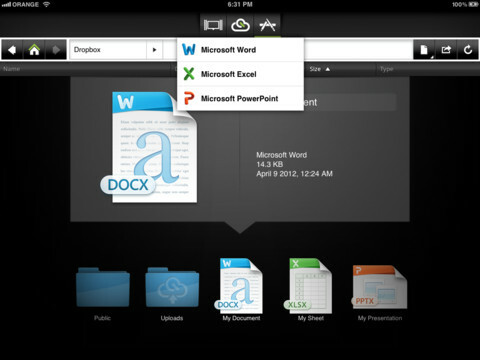 With this app you can as well be able to view Microsoft documents on iPad. 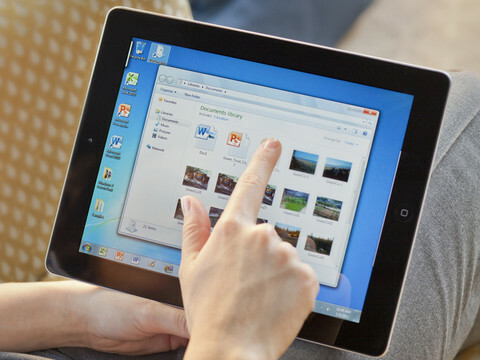 This app brings the Windows 7 experience to your iPad. Google Docs: Using Google Docs to view your Microsoft Office documents like Microsoft Word, Microsoft Excel and Microsoft PowerPoint is easiest method of reading Microsoft Documents on iPad or iPhones. Simply upload the document into your Google Docs account, and instantly be able to view it online. You can even edit them using the convert documents, presentations, spreadsheets, and drawings to the corresponding Google Docs format option while uploading. This option is best for people with internet connection on their device. Free Document viewers: Other free document viewers like Mobile Office Suite and iDownloads PLUS free can allow you to view Microsoft Office documents on iPad and iPhones. You can simply download and install them on your tablets. I hope I have been able to help you with this issue that once bothered me. Now you can be able to conveniently view your Microsoft documents on iPad and iPhones. Do you know of any other method of viewing Microsoft documents on iPad or iPhone? Please use the comment box below to share with me. I hope you find this post interesting enough to share with your friends. Use the share buttons to share. Remember to Subscribe to NetMediaBlog Feeds by Email so you can be getting more of my posts on your email even when you are offline. Hm… You forgot Microsoft Live.com, the best online offices docs viewer available. Am glad you mentioned that…..thanks though. I have been using Google Docs for a while and happy with it. However, it is nice to know there are alternatives in the market. Thank you for the article.